That last shot is fantastic, Jeff. You can just sense what a great scene it will be when you finish up the scenery there. Neat, most folks do not model from the uphill side of the hill. I like it! The shelves in the benchwork are also a great idea. At some point can you talk about the drop bridge at the end of the section? That scene is looking good, Jeff. The trestle/tipple are beautiful and your trackwork looks great. You sure are making progress on that backdrop it looks super. I am watching and learning. I would like some additional pics of that hinged swing up roadway you have there. I know you have posted it before, I want to see it again, I plan on doing the same, I am curious how the hinge is set and what happens to the rail when up and down in position. Jeff -- layout is looking VERY good! I can see that the automated dumping system is worthy of inclusion on cars for my retirement layout. I thought about dumping doors for Bachmann On30 hoppers like Tyco had in HO years ago but never got past the thinking stage. So many ideas and so little time! Ditto on the compliments Jeff...the shot of the train running against the new backdrop is striking! Less is certainly more in this case. Your Kemtron shay should be breaking in nicely. looks great, the backscene looks wonderful and the track layout looks good and fun to use :) and i love the shelving idea too. I just got back from a long weekend ice fishing in Wisconsin, fishing was good and the snow was deep. here is the shot of the bottom of a hopper car I modified by removing the DCC decoder I had installed to operate the doors and added the contacts to the bottom of the trucks. The contacts are a short piece of K&S square brass tube that is glued to the brake gear supports which are part of the San Juan Car Company trucks. The MC would not have had outboard brakes so I might cut off the brake beams and just leave the supports for the contacts, however I do like the looks of the brakes. I drilled a 0.020 hole in the side of the brass tube with I insert a 0.020 brass wire into with a wire soldered to it, this forms a removable pin that allows the truck to be quickly removed from the car. One contact connects to one side of the door motor and the other contact to the other side on the door motor. There are is no way to turn the hopper cars so as long as all the cars are orientated one way the doors will open and close the same. 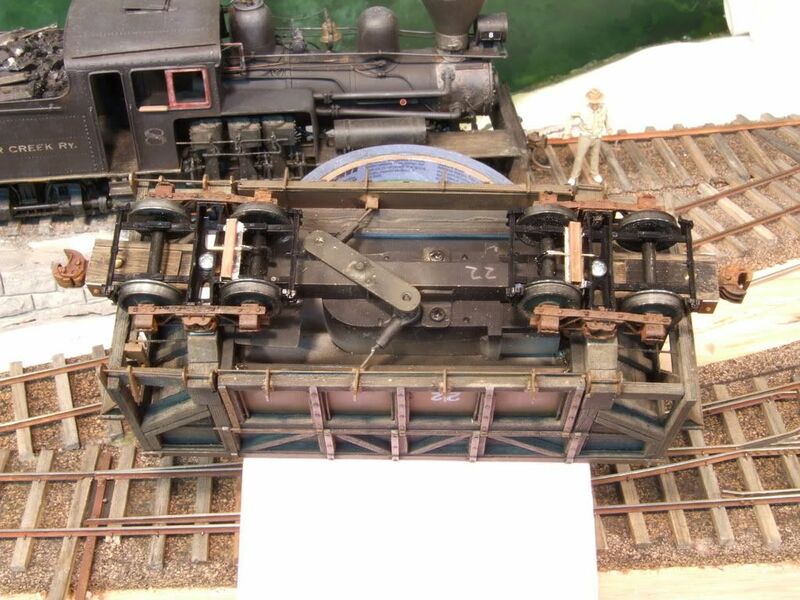 the contacts are about 1/8" above the rail head, the test contacts at the dump trestle will be modified to be a little smaller and to just stick up above the rail head while still clearing the foot boards on the locomotives. by this weekend I hope to get rail laid across the trestle and I will test dump my first car. 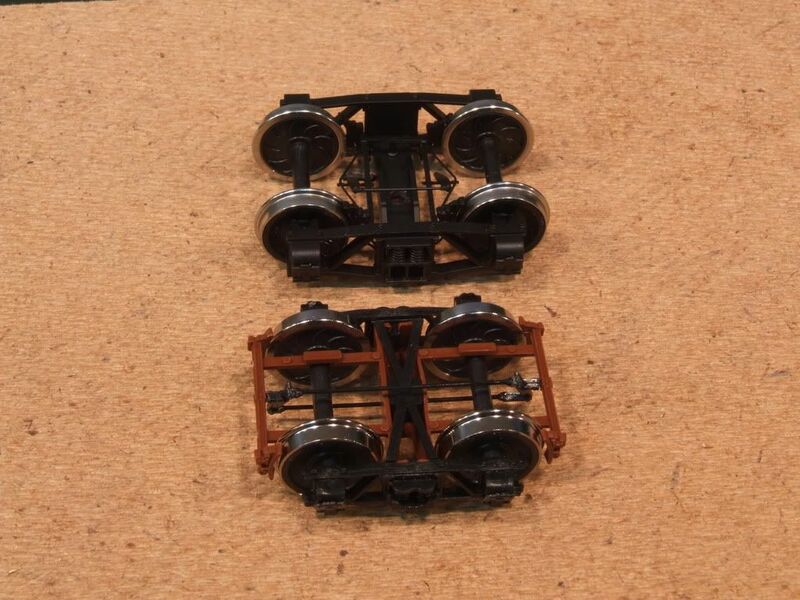 well...I just about pulled the trigger on purchasing 10 more pairs of SJCC #202 truck kits to build more hoppers when I noticed someting I had not seen before. Last fall I was looking at a SJCC frame tank car and could not resist buying it, I figured for fun I could run it when no one was looking, and it makes a nice display model in my new case. Anyways, while looking at it last night I noticed that it has a different truck design with inboard brakes just like the real MC hopper cars. The trucks that SJCC had under the tank car are really detailed and have the full brake rigging. While looking at the trucks I noticed that the wheel base was a lot longer than the #202 trucks I was using under my MC hopper cars. At the time I built my first set of MC hopper cars there was no match for the trucks the MC used under their hopper so I went with the #202 trucks because they looked good and operated well. The real MC used the twin I-beam design bolster and the #202 trucks I was using do not, however the new SJCC trucks under the tank car do use the twin I-beam. According to Ron Lane's book on the MC the wheel base under the MC hopper cars is about 4'-8", which is exactly what the new SJCC trucks are, which would make them a better choice to use than the #202 trucks. So the problem for me now is...do I replace the ten sets I have already purchased with the new SJCC trucks and buy 20 more pairs for the new cars, do I continue to stick with the #202 trucks since I already figured out how to get them to work with my unloading trestle, or do I leave the 10 I have as #202 and for the new cars to with the new SJCC trucks? The new trucks would look better under the hoppers because it would put the outer set of wheels closer to the ends of the car like the prototype, they actually slightly extend past the end of the car. The bolster on the new trucks are higher which would work better because I have had to make non-prototypical changes to the car design to make the #202 trucks to work. I am freelancing my cars somewhat so I could just continue with the #202 trucks and be fine with it. Tonight I will pull the trucks from the tank car and put them under a hopper to see how they look and if I can get the contacts to work on them. Boy that's a quandry! I guess I'd definatley build the new cars with the more appropriate trucks. I would then see if I could modify the existing cars and, if practical, slowly phase he new trucks onto the existing cars. Well, the truck question is a tough one ... meanwhile, the hoppers, layout & backdrop are all a treat for the eyes. Beautiful work! Last night I removed the trucks from the SJCC tank car and installed them on one of the cars I am building to see how they look. here are the two trucks, in the back is the #K220 truck from SJCC (RTR $16.95), in the front is the JSCC #202 (kit $12,95). 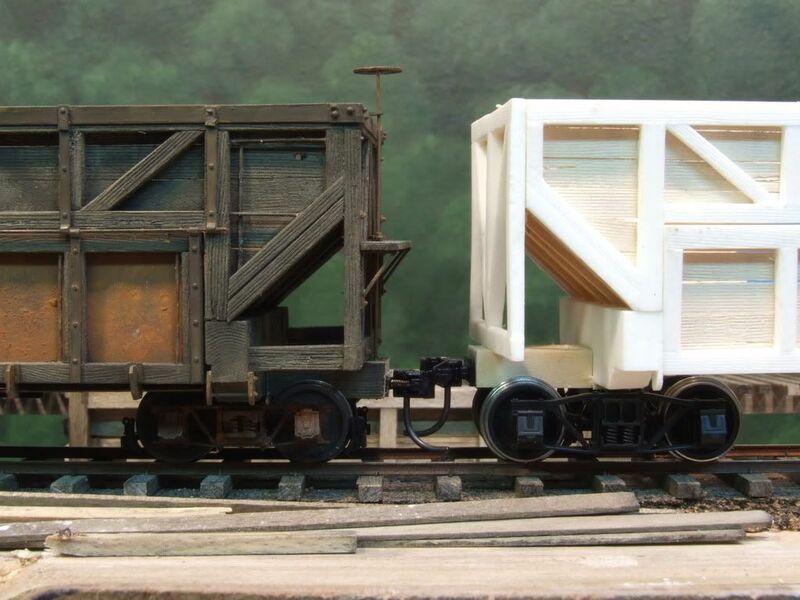 here is a side photo of the two hoppers next to each other. the K220 trucks make the car sit higher and I would have to lower the bolsters, which would be more correct. to use the 202 trucks I have to raise the bolsters a little. here is an end shot to show how the wheels extend slighty past the end of the car. seeing the two trucks under the car I am leaning toward sticking with the 202 trucks. I know they are a little small but the other trucks really look big to me, but maybe I am just used to seeing the other trucks for so long. maybe I should lower the bolster on the car with the K220 trucks to see how they look. It appears that you have made up your mind, but what if the newer cars used the bigger trucks and were numbered in a higher number series ie Phase II cars? Maybe even paint them differently to reflect a later acquisition. You could even leave the outboard brakes on the Phase I cars. this is the first test video, but I am going to say it is not the offical test. The offical test will come when I drive a train of hoppers out on the trestle and dump them using my new method of using contacts under the trucks, these are two of my cars still using onboard DCC decoders to test dump. Also, the rails are not finished being spiked down and the they are not connected to the tracks at either end. I wanted to test to see what issues I would have (if any) when I actually dumped a load of coal on the trestle. for these test I am still using real coal. I like the coal because when you dump a load of coal it smells like real coal and because it is hard the product unloads to about 95% with only a small amount of coal stuck in the corners of the hopper car. I simple car shaker could be installed under the trestle to help shake loose the stuck coal. The ground rubber is nice because it is clean and light weight, however it does not empty as well and there is much more locking of the coal in the corners and it takes more shaking to free the coal. All in all I am still shooting for using the rubber because I think the coal dust in the room will be too much of a headache over time. I will continue to lay the rails on the trestle and get it connected to the existing track so I can run a train out onto the trestle. 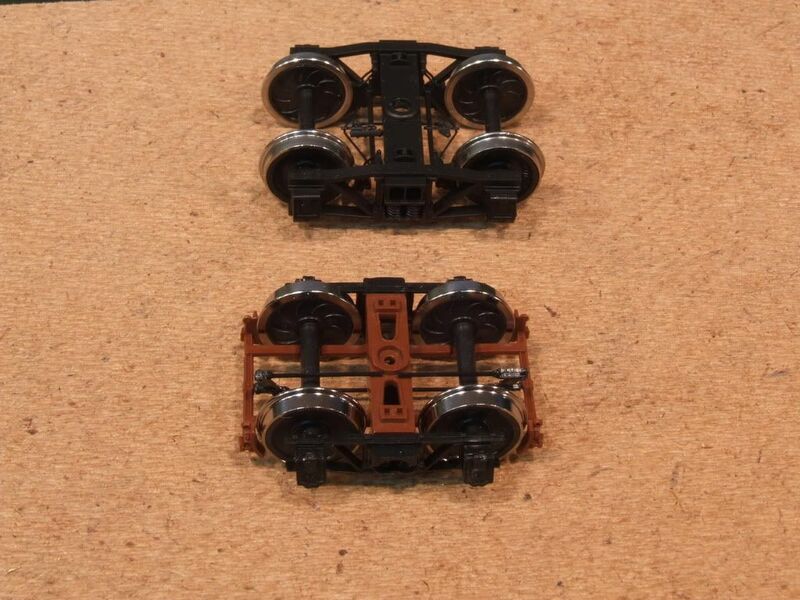 I am also going to wire up the power to the trestle contact so I can test unload one of the non-DCC hoppers. I am going to hold off the final fine detailing of the trestle until all testing and tweeking is done. once it all works I will build the shed over the bin and the chute extention that will go back to the backdrop and get in some basic ground cover under the trestle. in the test I noticed that a lot of coal over shot the top of the bin, this should be resolved once the shed is in place. 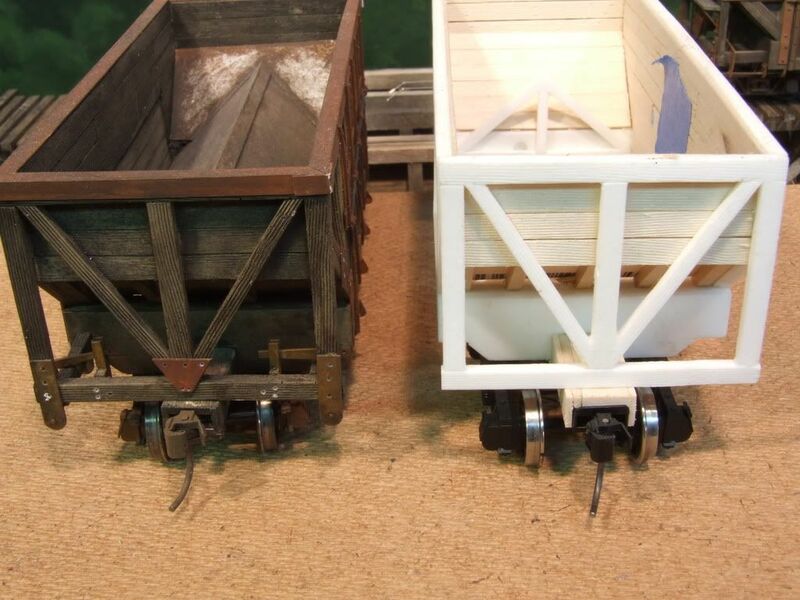 a future project that I am thinking about is converting two Bachmann EBT style hoppers to have doors that open. I am searching for a small motor to drive the doors.